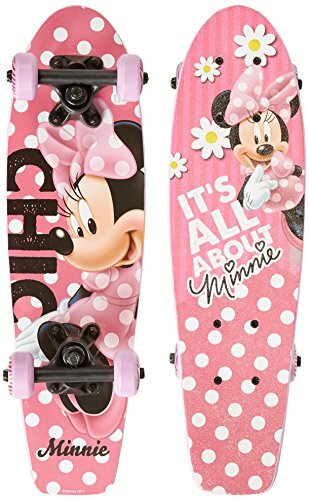 This cool children's beginner skateboard is a great choice for any Minnie Mouse fan who wants to start learning the balance and coordination that skateboarding helps kids acquire. 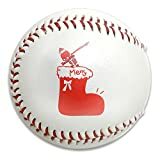 The Disney Minnie Mouse 21-Inch Wood Cruiser Skateboard from Playwheels has a brightly colored deck that features vivid graphics of your child's favorite characters. The 21-inch long 9-ply maple deck is thick, sturdy, and gives an aspiring boarder just the right amount of space to start riding with some room to keep growing. 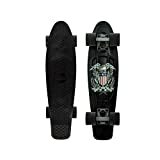 The special grip surface helps keep feet firmly planted on the board while the 6-inch deck width is great for smaller feet to practice balancing and ensure proper footing while riding. A single kick tail makes for easy maneuvering and offers a safe way to brake. PVC-injected 50mm x 27mm wheels and nylon bearings stand up to long use and deliver a very smooth ride whether at the skate park, on the sidewalk, or just practicing in the driveway. 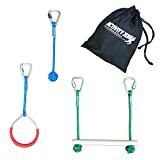 Recommended for ages 5-10 years, supports weight up to 100 pounds. Penny Graphic Skateboard - United We Stand 22"